Welcome to the Summer Edition of Jamaica Blue Escape. 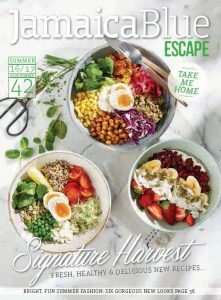 This issue is all about healthy eating, led by our brand new Signature Harvest Collection – please check availability in store. Sit back, relax and enjoy… and don’t forget to share your summer Jamaica Blue experience on Facebook and Instagram using #jbescape.